This volleyball game glossary is divided into 2 parts that includes an introduction and a learning games section for new volleyball players and fans. Volleyball game glossary is dedicated to passionate game players and fans that compete, watch this favorite of sport games and cheer volleyball gamerisms. Volleyball is a game invented by William C Morgan in Holyoke, Massachusetts in 1895 who was a YMCA physical education teacher. Morgan’s idea was a game played indoors by any amount of players, taking some characteristics from tennis and handball. The game later evolved into what we now know as volleyball. 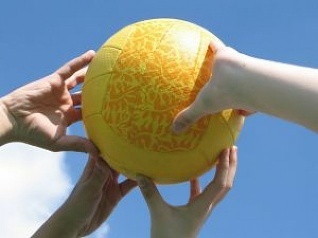 Volleyball is a game played by six players on a court with a net in the middle, separating the two teams. Each volleyball team attempts to score by putting the ball into play with serving to the team on the opposite side of the net. A point is scored when the opposing team fails to return the ball and it touches the ground, goes out of bounds or is hit more than three times by one team. A volleyball game is over when a team scores either 15 or 21 points and a win is awarded to the team with the most points. Ace: bullet serve that quickly scores a point. A whizzer with WOW! Approach: fast run by a spiker before jumping in the air. Assist: awarded when a player moves the ball to another player who then is able to score. Attack: an attempt to make the other team miss the ball, resulting in a point. Attack Block: opposing player who tries to block a spike before it crosses the net. Attack Error: resulting in a failed attack and point for the opposing team. Attack Line: line parallel to the net that is 10 feet back from where all spikes must take place by players on the back row. Attacker: team member who tries for a team point by hitting or spiking the ball. Backcourt: term for area from the end line to attack line. Back Row Attack: the act of a player in the back row who attacks the ball and attempts to score, usually in the form of a spike. Usually occurring behind the attack line. Back Set: delivery behind a setter’s back followed by a hit by an attacker. Back Zone: the marked space behind the attack line. Ball In: a ball is in when it lands inside any of the boundary lines. Ball Handling Error: call by game official for a double hit, blocking error or centerline violation. You get but 1 shot at the ball—them's the rules! Beach Dig: receiving the ball with an open hand. Block: occurs when a player blocks an attack from opponents at the net. Block Assist: occurs when more than one player blocks an opponents attack. Bump: the act of hitting the ball, on offense or defense, with both hands together using the flat of the forearm to hit the ball into the air in order to advance play. Campfire Defense: when a ball hits the floor, normally in a ring of defenders who look like they are standing around a campfire, amazed that the ball has touched the ground and no one defended it. Carry: the act of prolonging contact with the ball that is illegal. Centerline: the line running under the net, between the two posts. Centerline Violation: the crossing of an opponent into the other teams half of the court..
Chester: being hit with the volleyball in the chest. Do I hear an Ouch? Cover The Hitter: the act of multiple players attempting to block a particularly good attacker on the other team in order to block them. Closing the Block: two players close in together to create a defensive block to prevent the ball from touching the floor between them. Cross-Court Shot: term for organized attack from one end of the opposing team's side of the net to the opposite sideline. Crossing Space: the space over the net where the ball must cross in order to be in play. Cut Shot: a spike that is traveling at an angle across the net to the opposition. Dead Ball: a ball in play, declared dead by an official. Decoy: term for offensive play meant to camouflage the spiker. Deep Dish: a set where the player maintains control of the ball for a prolonged and illegal period of time. An extreme version of a carry. Deep Set: term for strategic play to put off the timing of opposing blockers. 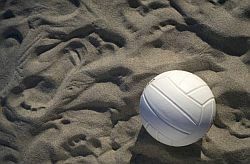 Dig: retrieving a ball that has been spiked or hit into your area, typically occurring low to the ground and resulting in a successful pass to a teammate. When successful, a smooth move! Dink: jargon for push of the ball around or over opposing blockers. Double Block: team of 2 players create a strategic move to deflect an attacked ball. Double Quick: team of 2 players move towards an opposing setter for a quick inside hit. Doubles: term for 2-player team on each side, usually a beach volleyball game. Double Touch: the act of a player touching the ball twice in a row, resulting in a turnover. Down Ball: jargon for ball in play that blockers determine will not result in a successful block or spike return. The beach, sand and Volleyball is thy name. Get into the game with this glossary in 2 parts. Stay on the attack, pick up that beach dig and follow your passion with Part 2.